I've had several requests for bracelets. 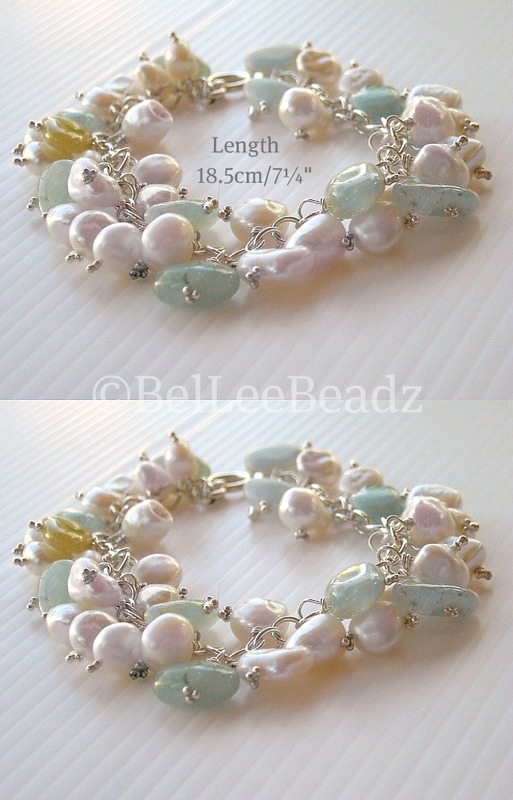 This is the first installment ..... freshwater pearls + smooth small aquamarine nuggets. Sterling silver chain, pins and toggle. Thank you for stopping by! I hope you enjoy browsing through my creations. Whilst this is a hobby for me, I take much pride in every piece that I create. The sourcing of unique materials consumes me and I do dedicate a lot of time in procuring gemstones, beads, findings that are unique and different. 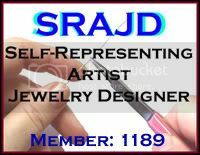 Do drop me a line if you would like something created specially for you. 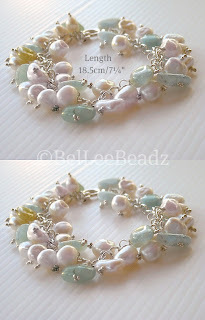 info@belleebeadz.com to check on whether the item/s can be replicated. Upon confirmation of purchase, payment must first be made before I proceed with mailing the item out to the buyer. Should you require me to hold the item/s, I will do so for up to 3 working days after which I will rescind the request to hold and release it to the next buyer who confirms purchase and makes payment. Custom Orders - I enjoy creating personalised pieces. If you have something in mind, do drop me a line specifying your request and we will work together to create something uniquely you. I accept paypal payment for International buyers, however, for local buyers, I would request either bank transfer or cheque payment. Should cheque payment be your preferred mode of payment, mailing will only be done after cheque is cleared. For local buyers who choose to pay by credit card, I will have to include postage charges to the price of the item.